BMW's CEO teased the successor to the i8 hybrid supercar in a shareholder's meeting today. The car will be called the i NEXT, will launch in 2021, and may indeed be the very thing that dreams are made of. 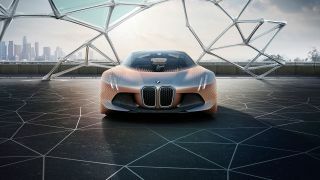 Details about the i NEXT are scarce, but BMW promises it will be their "new innovation driver, with autonomous driving, digital connectivity, intelligent lightweight design, and a totally new interior." BWM showed off its Vision Next 100 concept car to celebrate the company's 100th birthday back in March. The Vision Next 100 aims to integrate autonomous driving features while still providing a rewarding driving experience for those who choose to take the wheel. It's also safe to assume the i NEXT will be all-electric to rival the stuff that's rolling out at Tesla. The BMW i8 was a technological showcase when launched back in 2014, boasting a hybrid power plant and styling that was firmly future-facing. Instead of creating a hybrid for maximum efficiency (Prius, we're glancing your way), BMW used hybrid technology for performance. With a 0 to 60 time of 4.5 seconds and 76 MPGe, the i8 gave owners the best of both worlds. BWM will continue developing its other cars in the "i" line of hybrid and electric vehicles, including the pure electric i3. In a few weeks, the company will launch a new i3 with 50% more battery life. In 2018, BMW will launch a convertible version of the i8. It'll be a while before we see the i NEXT in the flesh, but the future of electric cars looks bright. And hey, you needed a few years to save up anyway, yeah?